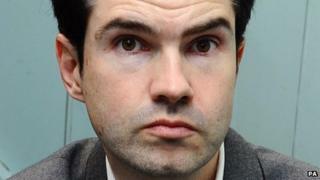 Comedian Jimmy Carr has apologised for using a legal tax avoidance scheme which enabled him to pay as little as 1% tax on his earnings. Criticism of the morality of his actions has come from the top. Prime Minister David Cameron intoned that "some of these schemes we have seen are quite frankly morally wrong", and Danny Alexander, chief secretary to the Treasury, maintained tax avoiders are the moral equivalent of benefit cheats. Acccording to the Times (which revealed Carr's tax arrangements), the comedian responded at a gig to his critics: "I've not broken the law. I've not done anything illegal. But morally, morally...". The ethical dimension had been explored by columnist David Aaronovitch, who argued in the Times that Carr's actions constituted a moral problem, rather than a legal one. And the leader in today's edition of the paper maintains this stance, claiming that such schemes, even if within the law, constitute "a form of cheating". Several readers' letters published in the Times today also point to the venality surrounding these schemes - with correspondent Richard Gunning proclaiming: "To describe this arranging as 'morally repugnant' is extreme, but there is a moral dimension to paying a just amount of tax. Rather like a lawyer 'arranging' the defence of his client, perhaps to avoid the truth, 'arranging' one's tax affairs via artificial schemes smacks of cynicism. It also smacks of greed…"
Pop star and Twitter queen Lily Allen, followed by over 3.5m people, warmed to the theme in response to another's missive: "How are tax avoiders 'the moral equivalent of benefit cheats'?... Surely they're a hundred times worse?". Carr's ostensible hypocrisy is, writes Tim Stanley in the Telegraph, his chief sin. The comedian's currency may have been devalued, argues Andrea Mann, blogging in the Huffington Post. She writes that Carr-directed censure stems from the idea of a satirist violating the trust that has been placed in them: "If anything blunts satire's weapon, it's being accused of the exact same thing you're lampooning." She continues: "Is Jimmy Carr behaving immorally by avoiding taxes, or simply being canny and frankly it's none of our beeswax? These are legitimate questions that could be argued 'til the cows come home." But, ventures Fleet Street Fox: "The true hypocrisy is not to be found in unimportant, unfunny Jimmy Carr and his couple of mill. It's sitting behind a desk in the Treasury, pilfering the pockets of the lower orders and stroking the egos of big, fat men with big, fat bank accounts." It's a point echoed by the likes of Stephen Pollard in the Daily Express. "It's a mistake to attack the people who use [tax avoidance schemes] for committing crimes that don't exist. We need the rich - whether they're comedians, singers or entrepreneurs - if we are ever to climb out of recession". "Let me be blunt", he writes, "only a fool would pay more tax than he has to. But instead of condemning the people who take advantage of tax avoidance schemes, we should blame the system that drives them to do so - and the politicians who created it in the first place." And whether Cameron is in any place to dish out such censure in the first place is debatable, the Guardian suggests, maintaining that the PM's family made their fortune in tax havens. As reported in the Daily Telegraph, Ed Miliband contends: "I'm not in favour of tax avoidance obviously, but I don't think it is for politicians to lecture people about morality." Carr also has his defenders in the shape of John Bishop and Rufus Hound, although the latter tweets: "A lot of people here seem to be making the case that tax avoidance's morally wrong. In which case vote to change it. I do." Rod Liddle, writing in the Times, also offers the beleaguered comedian his support and denounces the Jimmy-bashing: "This week has proved that Britain still rules the world at its favourite sport - kicking a celebrity in the testicles, repeatedly". He denounces Carr's critics: "So desperate are they to justify their attacks that they accuse the comic of 'hypocrisy' - because he ONCE told a joke about Barclays not paying the right amount of tax... I've always thought of him as a bit of a Tory on the quiet, although no less funny for that. But a hypocrite? What rot." And some even think this high-profile moralising could pay off for Carr by providing lucrative promo material. Kate W, writing on Twitter, suggests: "Jimmy Carr's next tour should use 'Morally wrong - David Cameron' as a poster quote".